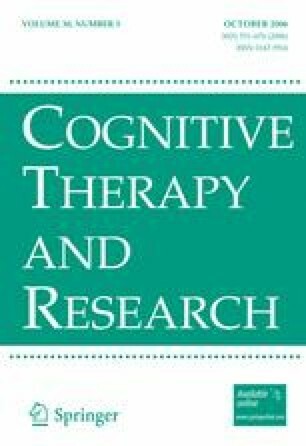 The present study compares core beliefs between a group of patients with social phobia (n = 62), other anxiety disorders (n = 41) and a group of non-psychiatric controls (n = 55). Participants completed measures to assess social anxiety and the Young’s Schema Questionnaire (123-items version) that is designed to assess 15 early maladaptive schemas (EMSs). Results suggest that the schematic structure of patients with social phobia differs from the one of patients with other anxiety disorders and from normal controls’. Patients with social phobia show higher levels of EMSs particularly in the area of disconnection/rejection than patients with other anxiety disorders. Regression analysis identified the EMSs of mistrust/abuse, social undesirability/defectiveness, entitlement, emotional deprivation, unrelenting standards and shame, as the ones that explain most of the variance in our sample subject’s anxiety that they felt in social situations and on fear of negative evaluation. This study was supported in part by the CINEICC financed by the FCT. The authors wish to acknowledge the helpful comments and suggestions of the anonymous reviewers on earlier version of this manuscript.